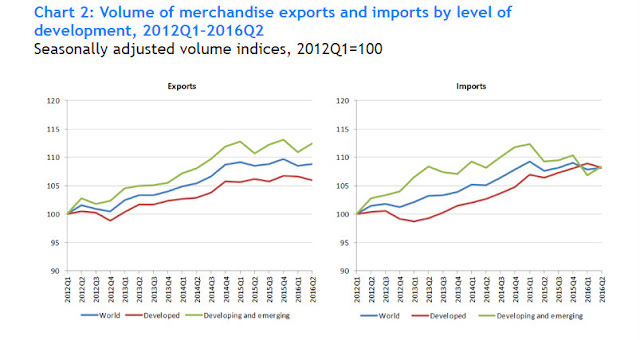 Import demand of developing economies fell 3.2% in Q1 before staging a partial recovery of 1.5% in Q2. Meanwhile, developed economies recorded positive import growth of 0.8% in Q1 and negative growth of -0.8% in Q2. Overall, world imports stagnated in the first half of 2016, falling 1.0% in Q1 and rising 0.2% in Q2. This translated into weak demand for exports of both developed and developing economies. For the year-to-date, world trade has been essentially flat, with the average of exports and imports in Q1 and Q2 declining 0.3% relative to last year. Now, ok, things were worse in the early 1990s, and much worse in the early 1980s. In fact if we went back further, we would also find things were pretty bad in 1973-5. Developed-world recessions are bad for global growth. But we don't have a developed-world recession now, do we? The developed world is struggling to get inflation off the floor, of course: interest rates are extremely low - in some places negative - and three major central banks are doing QE. In Europe, growth remains elusive and unemployment very high. The US is doing better, but has backed away from planned interest rate increases. Japan is now in its third decade of stagnation. And the UK, which was looking pretty good, has shot itself in the foot. In July, the IMF cut its global growth forecast by 0.1% because of the impact of the UK's decision to leave the European Union. In 2012, the story was one of developed countries in a slump: export volumes actually fell globally, but the strength of imports to developing and emerging countries prevented a disastrous collapse. The world should probably thank China and its satellites for preventing the Eurozone crisis causing a second global recession. Nonetheless, China's slowdown has drastic effects on its satellites. It has become a trade hub in Asia, importing goods from other countries in the region as inputs to final processing of items for export to the West. So an import slowdown in China ripples back to other countries in the Asia-Pacific region through the south-south supply chains. Part of China's slowdown is driven by a rebalancing towards domestic production and consumption. But part is due to weaker demand for its exports from Western countries. And why is Western import demand weakening? 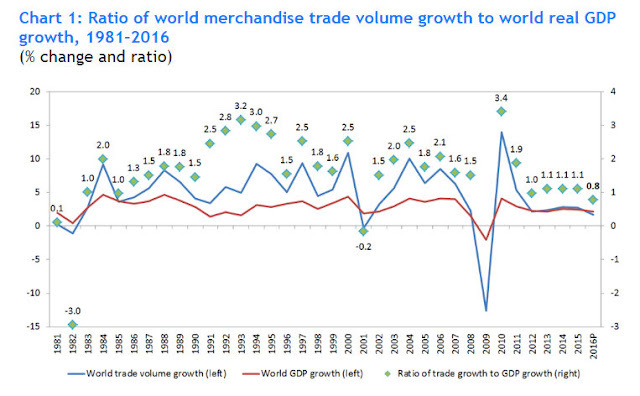 Well, if we knew that, we would know why global trade is weakening. Most analyses of the current slowdown that I have seen focus on the effect of economic fundamentals on import demand. 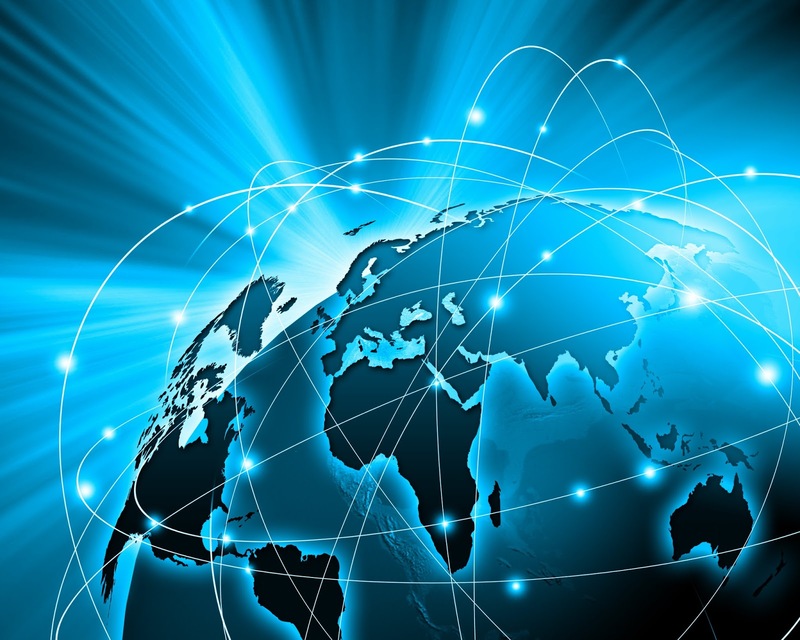 Some also discuss changes in international supply chains. Few seem to discuss finance, and if they do, they focus narrowly on trade finance, not on the global financial currents that drive all economic activity. But this is macroeconomics, and if there is one thing we have learned from the GFC, it is that finance is fundamental to macroeconomics. 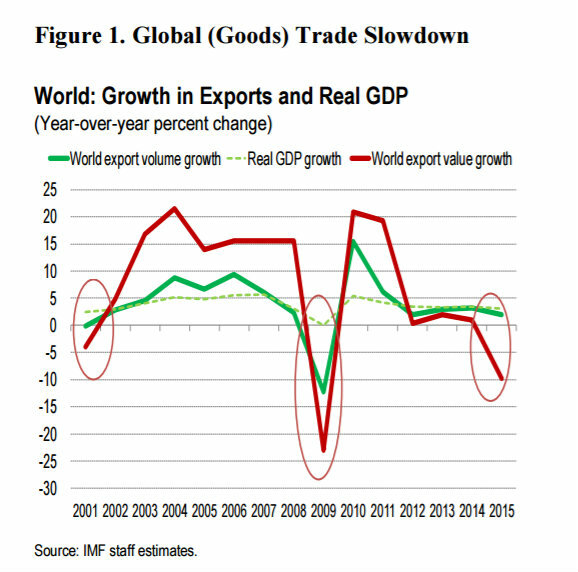 Papers that omit any discussion of the role of global financial flows - like, for example, the IMF working paper from which I took the above charts - are surely unable to explain adequately what is really causing the current trade slowdown. Well now. 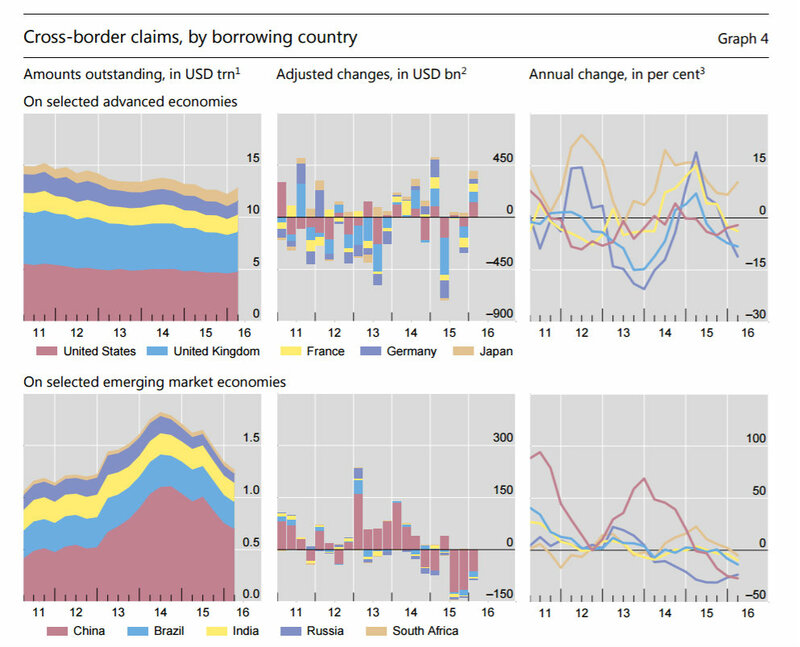 Cross-border lending (loans and bonds) has been flat for the last six years. In 2012-13 there was a marked fall in both lending and securities issuance by banks. And there now appears to be another sharp contraction in bank lending (chart 1) and a tailing-off of securities issuance by both banks and non-banks (chart 2). Please don't tell me that this remarkable similarity is purely coincidental. Now that we know how fundamental finance is to macroeconomics, we must surely admit that changes in cross-border financing must be a key part of the global trade slowdown story. Indeed, although I would normally be the first to say correlation doesn't indicate causation, in this case I would stick my neck out and say the contraction in cross-border lending is the primary cause of the sick state of global trade. The reason why the cross-border lending slump precedes the trade slump is because businesses and households can run on reserves for a while when their funding is pulled, and because just as rising investment takes time to flow through into increased trade, so falling investment can take a while to show up as declining trade. 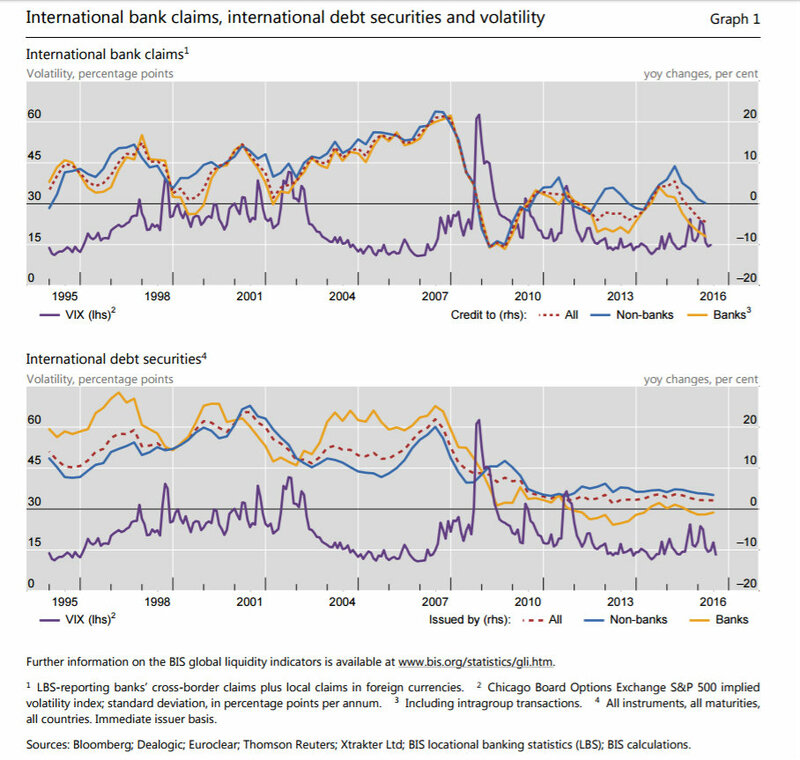 The one bright spot in this dismal set is the Euro debt securities issuance. But sadly this is not what it seems. The BIS explains that this is due to "reverse yankee" issuance by American corporations who have discovered that it is cheaper to fund in euros and swap into dollars than to fund directly in dollars. Accompanying this explanation, the BIS has an interesting paper on why "covered interest rate parity" appears to have failed. It is a story of over-enthusiastic regulation progressively destroying the mechanisms that make markets work efficiently. But if shrinking cross-border financing is a large part of the answer to "why is global trade so weak? ", then the next question is surely "why is cross-border financing shrinking"? Why are investors pulling back from lending into emerging market and developing countries? Why are banks shrinking back behind their borders? Is this behaviour a consequence of falling demand in Western countries, and if so, why is demand falling? Or are there other drivers? I will attempt to answer this in another blogpost, with the help of the IMF, which has just released its October World Economic Outlook report. It does not look cheerful. Correlation is not causation, as you say. 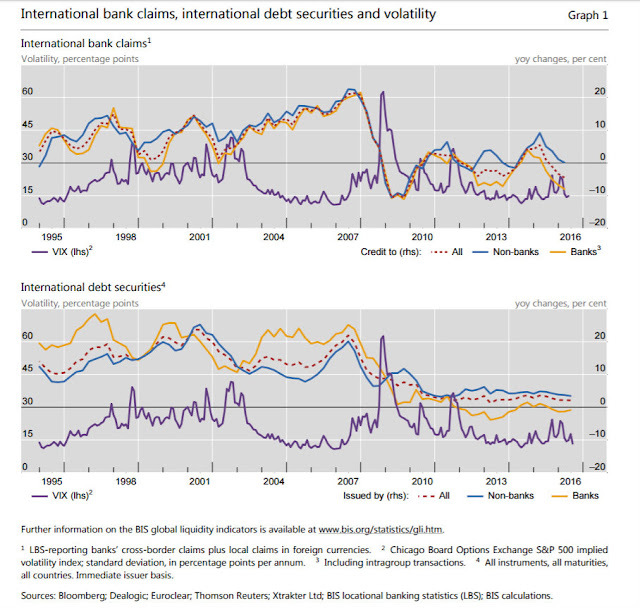 At the risk of pre-empting your next post, is it not likely that the fall in cross-border lending and weakness in global trade are both symptoms of the bigger underlying problem, i.e. sluggish growth in consumption and investment as economies everywhere (DM and EM) struggle with excessive debt burdens, both private and public? This would also explain the apparent contraction in Eurodollar money supply as the global banking system deleverages. The fall in cross-border lending would be entirely consistent with that phenomenon. Was about to answer something in a similar vein. Will add that the qualification of "sluggish" seems tied to a mean reversion of the immense Chinese investment flow of the 2000-2009 era. The paper by the ECB is actually pretty interesting in this regard (http://www.ecb.europa.eu/pub/pdf/scpops/ecbop178.en.pdf?ada8c9e466ff8893f3cc7526d225918a). Following all this, I wonder to what extent the accumulated external financing by exporters along with the slowing of export growth (and thus the smaller resources to sustain this financing) will feed on itself. Working through the numbers now. But doubtless readers of this blog already know that. I am not spending as much, as is the case with many like me. Moreover, I will not in the future be spending anything like the amounts in the past. I am with you 150% on this. And so are a lot of my friends. Scientists are working to increase agri-yields by up to 1,000%. But basically I simply do not want or need all the expensive stuff that loses 80% of its price immediately. I have rediscovered cooking at home. Economists and bankers have simply lost the plot. Somehow they all think that the new round pegs of human economic behaviour should fit into their old square peg models of the last fifty years. The hammers they are using are causing a lot of pain. Consumption patterns vary quite a lot with age. In particular, older people spend much less on goods (they already have everything) and much more in services (notably health care, catering). As the entire Europe and large parts of Asia (especially Japan, but also China) are rapidly "greying", a corresponding shift is to be expected. Meanwhile, the younger generations do not find jobs, or poorly paid ones, and see their income squeezed by "fixed costs" such as housing rents, insurance, and health care. Is it a surprise that international trade diminishes as a consequence? Inflation is the bankers' tactic to confiscate wealth. And I have yet to see a single coherent analysis of why reaching 2% inflation will fix any issue whatsoever. It would only allow the central bankers to sit back, pat themselves on the back and say "job done". The "debt dynamic", or how to keep the banks solvent, requires not only a 2% inflation, but also wage increases considerably above that level. This is hardly going to happen. Carnie, it now seems, has been brought in to sink the gbp down to parity with the usd. This is a tried and tested third world tactic to boost exports and encourage inward investment. Unfortunately the uk has not much left in the way of stuff that the world wants to buy, and productivity gains in selling each other overpriced housing do not bring in forex to pay for the imports. And what happens if the uk managed to ramp up inflation to say 10% with corresponding wage increases? As it is unlikely that this "British wealth increase" will be accepted by the rest of the world, it will be reflected in the exchange rate until noodle soup sellers in Asia can afford to take a holiday and wonder how the mighty uk became relegated to a "developing nation". I thought we had four major cb's qe'ing government deficits? BoE, BoJ, ECB and the fed? Is not "flat growth" good enough? 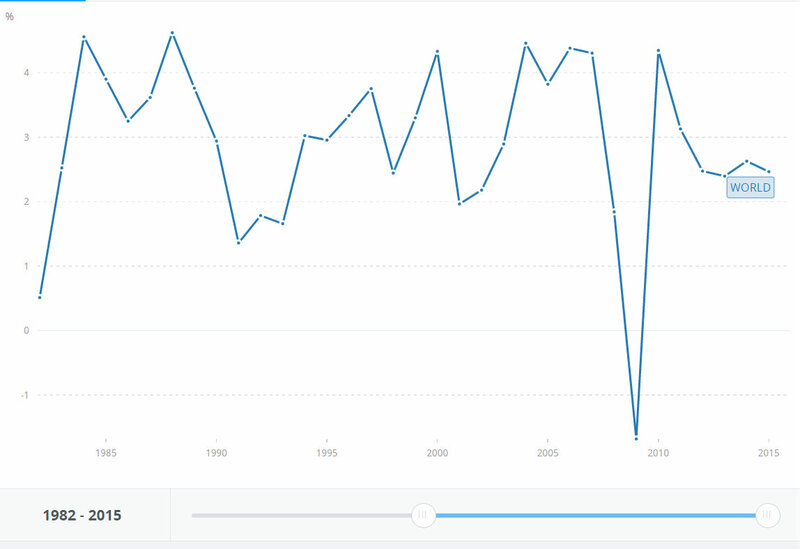 Chart 1 shows world gdp growth pottering around 2 to 3 percent since 1981. Growth on growth would put an exponential on top of the exponential we already have. I doubt if the planet would be able to sustain that. And the baby boomers are retiring and spending less. A quick browse of the IMF report and its four chapters worries me a little because I see some confirmation bias in the report. The key message seems to be that commodity prices have dented world trade with protectionist trade policies particularly around anti dumping also playing a part. There is a a suggestion that perhaps developing nations should move a little faster in liberalising subsidised industries. There are some interesting bits of information scattered throughout the report that hint at some different policy response options. Take for instance the 15 percent drop in native females in the UK in high skilled jobs since 2000 or the number of highly educated workers in low skilled jobs in the UK reaching above 35 percent compared to much lower levels in other countries. Then look at the nominal unit labour cost annual rate of change for advanced economies and compare it to head line inflation (labour costs are shrinking). I see commodity price indices show a drop since 2005 except for food which is up around 40 percent (If I am reading the chart correctly which is doubtful). Industrial production in advanced economies is pretty much flat since 2010. 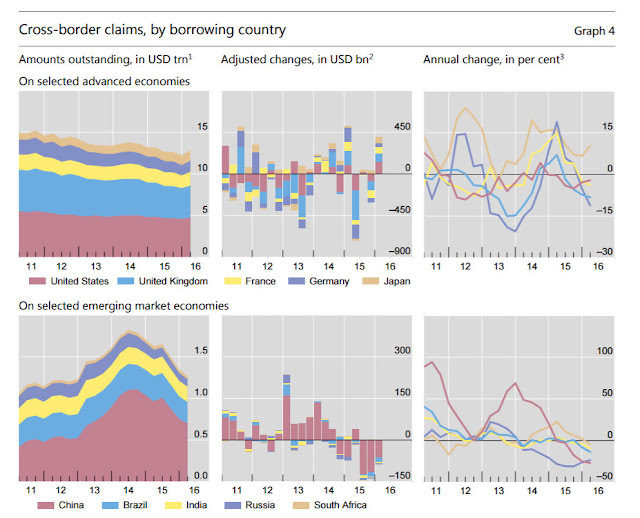 You can also see banking pulling credit from some emerging economies. So it looks like we are in a race to the bottom for workers rights with significant reductions in skilled job opportunities (We have a world trade organisation but no world workers organisation)(Should trade tariffs be based on workers rights?). Inflation may be very different for the poorest in the economy and head line inflation may be the wrong measure for wage negotiations (Central banks could publish a better inflation rate for this). Government Tax receipts due to shrinking labour costs are con-straining their ability to act. The velocity of money globally is reducing due to a combination of tightening banking rules, poor investment opportunities and the rich or retired trying to protect their asset wealth. At the same time we have people starving, crumbling infrastructure if it even exists. Seems like a good opportunity to print money globally on the back of the SDR (Special Drawing rights) system to combat a global problem. Hopefully Francis will have spotted something I have missed and I look forward to reading about it. Francis are you sure the causation does not run the other way ? Meaning decreasing value of exports from EMs to DMs due to sluggish DM growth but also lower oil prices -i.e. 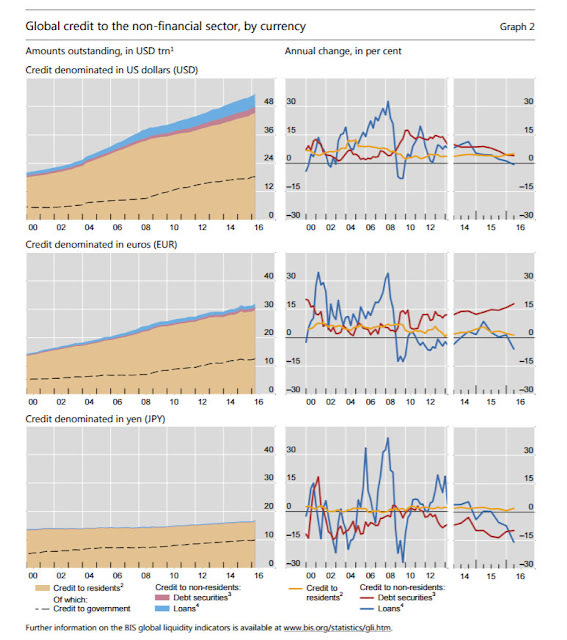 smaller EM trade surpluses - also causes a decrease in EM net foreign investment ?